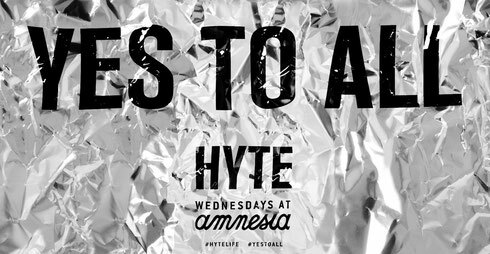 With an Ibiza pre-opening already under their belt and brand new New York, Croatia, Italy and Beirut parties freshly lined up for 2016, HYTE are ready to showcase their own brand of deep and energetic techno every Wednesday at Amnesia, Ibiza. From 29 June they will be in place for 15 weeks throughout the entire summer, closing out the season on 6 October. The Opening party aims to set the standards for the rest of the season with the combination of residents Loco Dice, Pan-Pot and Chris Liebing all under one roof. They will be joined by the talents of Detroit’s Robert Hood's Floorplan alias and Rotterdam’s Benny Rodrigues to complete the opening line-up. After a debut year in 2015 and with collaborations in 2016 from clubbing brands FUSE and Il Muretto, HYTE has possibly acquired the stamp of quality and authority by techno lovers the world over. Look out for future appearances from artists including Maya Jane Coles, DJ Harvey and an Ibiza 2016 LIVE exclusive from Caribou.